The first air cleaner to use Hyper-HEPA technology, the HealthPro has a micro-particle retention rate which is up to 100 times higher than that of conventional HEPA air cleaners. Each and every HealthPro delivers an entire system efficiency of over 99.97% for particles equal and larger than 0.3 microns and over 99% efficiency for all particles smaller than 0.3 microns. The HealthPro uses the highest quality German engineered, high-performance fan available. Our centrifugal, backward curved fan has an astonishing 700 cfm rating. Its 2950 rpm make it the most powerful fan in its class. Because each fan is individually balanced and uses steel ball bearings, it will give you reliable quality performance for many years to come. 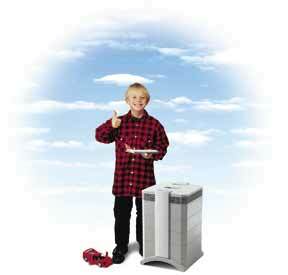 With its large fan motor, the HealthPro produces more clean air with less noise. 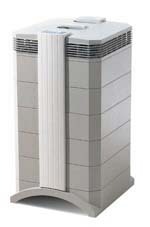 Unlike most air cleaners, which have the fan motor located after all filter stages, the HealthPro has the fan in the center, in-between its noise absorbing filters. We've also created a unique double-walled housing design and gone to the trouble of adding 8 vibration-absorbing rubber pads.The results are impressive.The HealthPro is suitable for even the most noise sensitive environments and virtually inaudible at the low fan speed settings. 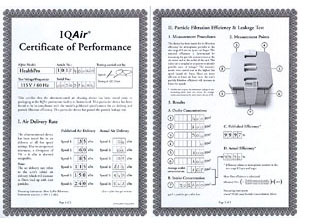 In an industry where most air cleaners don't actually meet the manufacturers' claims, IQAir tests and certifies each and every HealthPro. In their state-of-the-art Swiss production facility, each HealthPro is tested for particle filtration efficiency, filter leakage and air delivery. Each HealthPro comes with its very own two page Certificate of Performance, detailing the test results for that very machine. IQAir's quality control engineers only approve products that pass our stringent testing.That's how serious they are about real performance. Independent Filter Stages - Conventional air cleaners often combine several filter types in one filter cartridge. As a result, the whole cartridge has to be replaced even if only one filter type is used up. The IQAir HealthPro has a modular design, which allows each filter type to be replaced individually, saving you money in the process. Intelligent Filter Life Monitor - Ordinary air cleaners let you guess when to replace filters. Or they build in an automatic timer that lights up after a set period when they want you to replace your filters. IQAir's intelligent filter life monitor takes actual use, speed settings and air quality conditions into account. You'll know the remaining filter life of each individual filter, down to the hour. Super Efficient Pre-Filter - The HealthPro features the most efficient pre filter of any household air cleaner Most air cleaners use pre-filters with particle efficiencies well below 20%, which causes a great strain on the HEPA filter.The HealthPro's pre-filter retains over 90% of the particle weight in the pre-filter, allowing the HyperH EPA filter to last up to 5 times longer than similar filters in ordinary air cleaners. Even though it's extremely powerful, the HealthPro is also energy efficient. This is achieved with one of the most efficient fans in the industry and an electrical design that reduces energy consumption. This ensures that your HealthPro costs only pennies per day to use. Most air cleaners return the air through a small outlet, which creates annoying air drafts and noise. The HealthPro is designed to avoid air drafts. It evenly disperses the clean air through a large 320-degree vented diffuser, so you will always feel comfortable. IQAir doesn't use a metal housing, since they dent easily and the paint readily scratches and chips. Built to last a lifetime, the HealthPro is manufactured from fully-cured, high-grade ABS (even stronger than your home computer). Unlike low grade plastics used in some air cleaners, IQAir's housing materials are impact resistant, contain no heavy metals (used in some paints and pigments), are halogen-free and don't off-gas. With its sculptured design, the HealthPro enhances the decor of any home or office. Engineered and manufactured in Switzerland, the IQAir HealthPro is the result of superior craftsmanship and continuous research and development.